Alaska plantain post-flowering, with unopened seed capsules. The distinct leaf stalks are clearly visible in the right-hand photos. Photos by Kelly Fretwell. Alaska plantain is a perennial plant with very small greenish-brownish flowers. These lobe-shaped flowers are composed of four fused petals. They grow in spikes that are short and dense during flowering but then expand and loosen when mature. The fruits, pictured above, are egg-shaped capsules. Alaska plantain has non-fleshy, smooth basal leaves and no stem leaves. 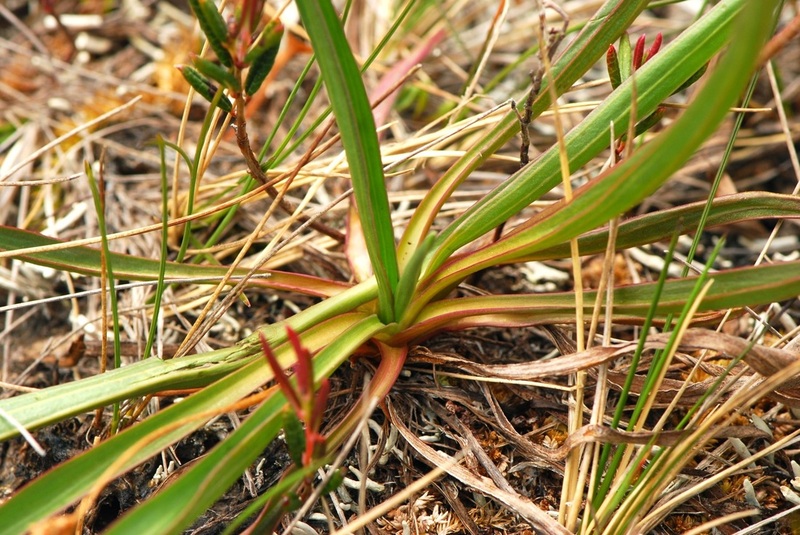 The basal leaves are long and lance-shaped, with several veins, narrow bases, and distinct stalks. Alaska plantain grows from a thick taproot. 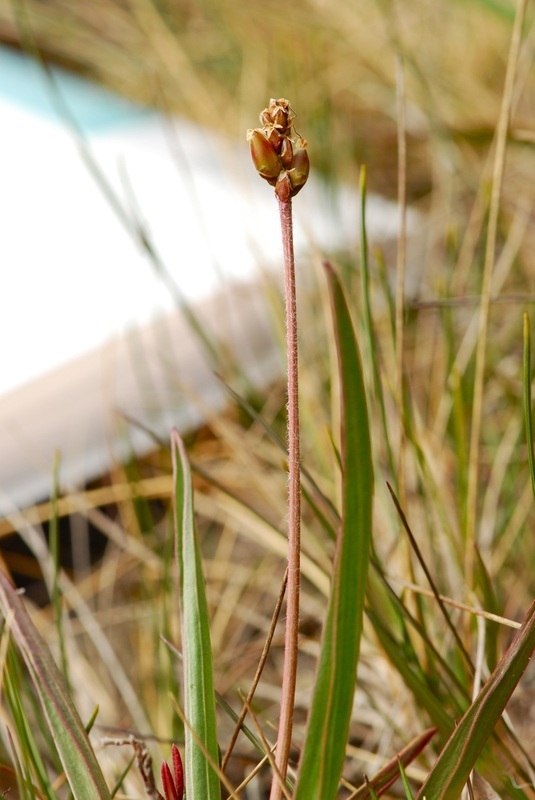 Alaska plantain grows in moist to wet meadows, shorelines, tidal marshes, and bogs at low elevations. It is a coastal species and is common from the Central Coast to southern Alaska. It is less frequent from the south coast of BC to Oregon. Alaska plantain also grows in coastal habitats of eastern Asia. 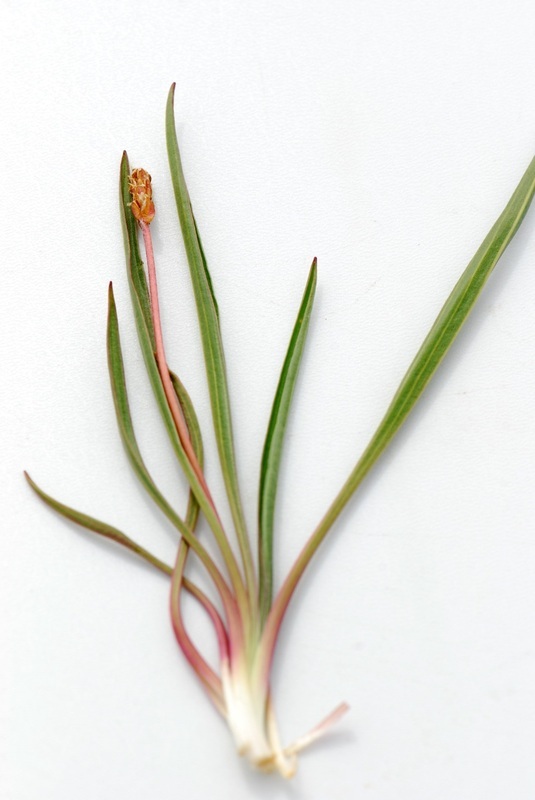 Seaside plantain (Plantago maritima), a similar coastal species, can be distinguished from Alaska plantain by its thinner linear leaves that lack the distinct stalks of Alaska plantain. 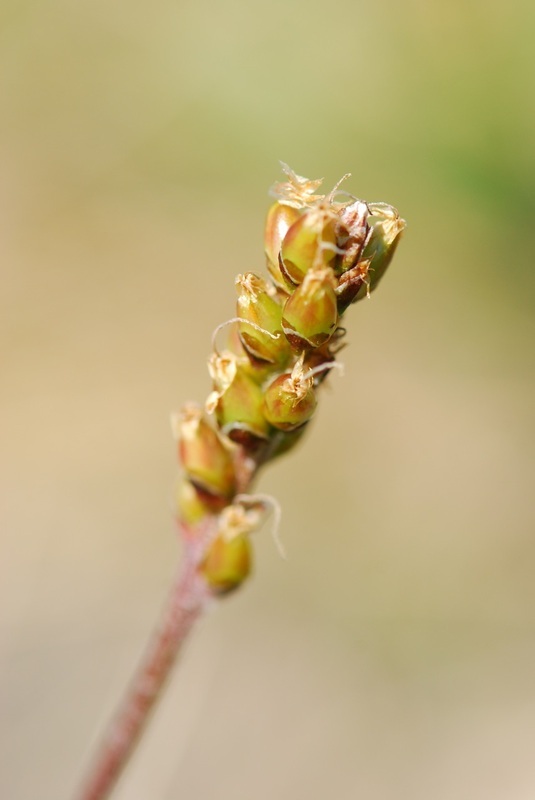 Mature plants can be differentiated by their seed capsules - those of Alaska plantain are large and unopened at maturity, while sea plantain seed capsules open up along a midline. Plantago macrocarpa Cham. & Schltdl. In Klinkenberg, Brian. (Ed.). E-Flora BC: Electronic Atlas of the Plants of British Columbia. Lab for Advanced Spatial Analysis, Department of Geography, University of British Columbia, Vancouver. Accessed 09/07/2014.